On Saturday, June 22, an ABCUSA Biennial Academy offering a variety of activities will include continuing education and spiritual growth opportunities for both clergy and lay leaders! Many different options will allow for something for everyone, including learning tracks with credit available, Bible studies, workshops, and educational seminars.For a PDF listing click here, or continue to read descriptions below. ABCUSA Biennial Academy – Full Day Tracks, Attendees cannot choose another session. Attendees who select one of these two all day tracks cannot select other sessions during the ABCUSA Biennial Academy on Saturday. Time: 9:00 a.m. – 11:45 a.m. and 2:15 p.m. – 5:00 p.m.
Track Description: This track is for individuals who are exploring a personal call to join God in global mission or church leaders who can encourage those considering a call to serve. This interactive track will answer questions and tackle practical issues of what’s involved in becoming a global servant. Track Description: The health and vitality of ABCUSA is dependent upon the health and vitality of the local church. Many congregations are plateaued, inward-focused and declining. There are many factors that contribute to this reality and no “silver bullet” exists. However strong, transformational leaders committed to an outwardly focused agenda of taking the Good News of Christ’s Love to the community are key to the church’s transformation. This track will focus on four critical areas for the Transformational Leader who is seeking to be used by God to help bring about renewal in their church. The next set of options are full morning and full afternoon sessions. 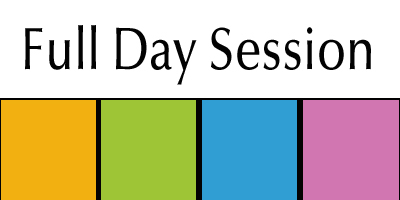 Attendees who select one of these extended sessions will commit to the entire morning and/or afternoon session, and cannot select another session for the same time period. Session Description: The United States of America, 5% of the world’s population, warehouses 25% of the world’s prison population. The land of the free is, by far, the incarceration capital of the world. And, in no area of American society are the legacies of slavery and segregation clearer than in the criminal justice system. How can the church and other communities of faith respond? Based upon work being done right now by Ebenezer Baptist Church of Atlanta, and an array of multi-faith partners, this workshop will explore this human rights catastrophe while providing practical responses, including organizing church-based expungement events, cash bail initiatives and how to draw upon the moral vocabulary of our faith to change the narrative about criminal justice. Leadership: The Rev. Dr. Raphael G. Warnock, Sr. Session Description: How conditions for children in economically poor neighborhoods are being adversely impacted in this current social-economic and political climate. What faith-based community organizations are doing in response. Session Description: In the past ten years, violence has been inflicted on a scale that has never been seen in human history. In this two-part session (2.5 hours) you will learn how the Christian non-profit AMOS Health and Hope based in Nicaragua uses restorative practice circles to promote health and healing, and how you can use circles in your ministry to improve emotional and psychological well-being, reduce conflict, and create safe spaces for sharing. 1. Understand the crisis in Nicaragua and the use of restorative practice circles with staff, communities, and churches to help with healing and understanding during times of conflict. 3. Reflect and dialogue about ways to use restorative practice circles in your ministry. Track Description: The Church is rediscovering its identity in mission. More and more churches are taking seriously the call to engage with their communities, and many more would like to. But this new mission landscape is going to need new skills of leadership and new frameworks for church. Leaders and congregations who will move to the mission edges and foster fresh expressions of church to reach people beyond the reach of the church as we know it. Leaders who will take on the adaptive challenges within existing churches to catalyze new energy for mission. Leaders who will make room for experiments and risks for the sake of the gospel. This track will explore new options for church leaders to be energized and equipped to fling open the doors of their congregations, to step out into the world around them, and lead their church into the future. Session Description: For over a decade, the Fresh Expressions movement has worked to understand how to be church in a changing culture by creating new forms of church alongside inherited congregations. The movement has brought widespread impact and renewal throughout the UK and is now rapidly spreading throughout the US. Each month, new leaders (both lay and ordained) are discovering that they can start fresh expressions of church to reach those beyond the reach of the church as we know it. Along the way, congregations are being revitalized in unexpected ways and all the people of God are experiencing a renewed sense of calling and purpose to be the church. Join us for this two-session morning track to discover the impact and potential of this movement for your leadership and ministry. Session Description: Leaders across the country are rediscovering Jesus' dinner table theology that dominated the Apostolic Era. The present-day Dinner Church movement is giving leaders and churches a renewed ability to reach people who would never attend their Sunday morning gatherings. It is also proving to be a scalable and reproducible model of mission as the church moves into a new era. Join us for this two-session afternoon track that could provide an important option for the future of your congregation. Session Description: The Hispanic population in the United States is culturally rich, diverse and exponentially growing. The unique challenges facing First, Second & Third Generation Latinos provide the church with unprecedented opportunities for Latino congregations to grow today. This two-session afternoon track will explore how cultivating Fresh Expressions can maximize the potential of the Church to reach diverse and multicultural communities, particularly within Hispanic cultures. The same information will be offered in both the Full Morning Session and the Full Afternoon Session. All churches occasionally experience seasons of transition when a pastor leaves for either a new ministry opportunity, retirement, or other professional interests. The time between pastors is referred to as a transition/interim time, or an in-between time. The transition time can be a challenge that can un-nerve a church or can be a fruitful time for congregational development and renewal. One-thing for sure is that churches in transitions between pastors need a trained interim minister to guide them through the transition and prepare for the calling of a new pastor. Clergy wishing to serve as an interim/transition minister need specialized training to be effective in addressing the variety of today’s issues being faced by churches in transition. 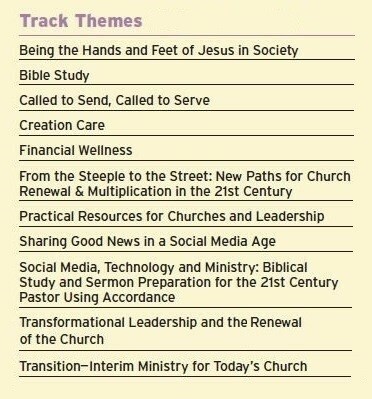 Description: “Transition - Interim Ministry for Today’s Church” will provide clergy and church leaders a basic understanding of the need for churches in transition to call trained transition/interim ministers, and or clergy wishing to serve as interim ministers to receive specialized transition/interim ministry training. The extended workshop will include a variety of modules that will highlight key issues faced by churches in transition, the need for trained transition/interim ministers, and specialized transition/interim training for clergy considering interim ministry. The workshop will introduce Transition Ministries ABCUSA as a resource for churches seeking an interim minister, or clergy seeking interim ministry placement opportunities. CEUs offered: Attendance at the full morning or full afternoon session is equal to 2.5 hours of continuing education, or .25 CEUs. The next 24 options are individual options. If you have selected a Full Day Track or a Full Morning Session/Full Afternoon Session, you may not select an individual session during the same time period. Attendees are not required to attend multiple sessions offered by these tracks, and may mix-and-match Individual Sessions, and/or Full Morning or Full Afternoon Sessions. Session Title: Being Jonah in a World of Ninevites. Session Description: Who are your Ninevites? How does one approach Ninevites? Does Jonah get it right? In this session we will look at the overall missiological thrust of the book of Jonah, seeking the implications for us as Christians in our current context. Session Description: There is a traditional Burmese saying, “myinma mini yawkya phawngsi” which means that the risk of a man working on a boat is like a woman at childbirth. In the earthly days of our Lord, working on and traveling through Sea of Galilee was not an option. It was part of life. Quick and constant change of the sea was a natural occurrence, and so was the risk of people working on it. Jesus was walking on the sea of storm while the disciples were struggling. Then the sea calmed down to show that Jesus is its Master. Peter even was able to walk as long as he kept his attention on Jesus. As we work on the sea-of-life, all sorts of storms are opportunities to invite Jesus, walk with Jesus and show the world anew that Jesus Christ is the Lord of the sea-of-life and the universe. Description: En la jornada profética de Jonás, el huyó, atravesó angustia, tuvo coraje y cuestionó a Dios; aun así, experimentó su justicia y misericordia, el mismo mensaje que Jonás tenía que compartir con los Ninivitas. La experiencia de Jonás nos invita a respondernos: ¿Dónde estamos ubicados en nuestra jornada profética? ¿Cómo respondemos a la pregunta de Dios? Description: La prophétie de Jonas pour le peuple de Ninive révèle l’universalité et la compassion de Dieu envers les perdus. Le refus du prohète d’accepter l’ordre du Seigneur d’aller précher la répentance aux païens (les Ninivites), de peur qu’ils n’obéissent et que Dieu ne leur pardonne. Explorons ensemble le miracle de Dieu à l’égard de son prophète afin de sauver le peuple de Ninive. Description: When one of ancient Israel’s most famous prophets is assigned the case of investigating a crime spree in the foreign city of Nineveh, Jonah takes off for parts unknown. As our wayward prophet careens along a comical thousand-mile misadventure in which he encounters a crew of superstitious Phoenician sailors, a whale, a city full of evil-doers, a scorching sirocco, a scrubby tree, a worm, and a herd of righteous cows, Jonah is forced to confront his deepest fear. This session led by Professor Gregory Mobley of Yale Divinity School will explore one of Scripture’s best-known stories, uncovering its continued relevance to a world riven with culture clashes, threatened by ecological degradation, and overgrown with superficial, self-righteous religion. Description: El libro de Jonás es un gran ejemplo para entender el llamado de Dios para la iglesia de hoy. En este estudio biblíco reflexionaremos sobre el llamado de Jonás y las implicaciones de su respuesta en su entendimiento acerca de Nínive. ¿Por qué Jonás huye de Dios en medio del llamado? ¿Cómo esta historia nos ayuda a entender el mandamiento más importante de acuerdo a Jesús: ama a Dios y a tu prójimo como a ti mismo? Para responder a estas preguntas, tendremos en consideración a Jonás como ejemplo para acercarnos a narrativas del Nuevo Testamento, específicamente el libro de Hechos, tomando en consideración a los Gentiles. El estudio bíblico se enfocará en temas como peregrinaje, immigración y respuestas teológicas para el llamado de Dios a la iglesia de hoy. Session Description: This session, led by the Reverend Tom Carr, offers a biblical, theological and spiritual basis for the work of creation-justice. In an age when the most vulnerable human beings are crying out in the midst of global ecological devastation, how does our Christian faith speak to our call to be servants of God’s Love for all life? This session will offer another lens through which to see our faith and ministry in relation to all God’s creation. CEUs offered: Attendance at each session is equal to 1.25 hours of continuing education, or .125 CEUs. Session Description: We all depend on nature to flourish; that is one reason that God calls us to care for creation. When creation suffers, the most vulnerable among us bear the consequences. Join this session and our ecumenical partner, Blessed Tomorrow, to become a Blessed Tomorrow Climate Ambassador. Climate Ambassadors serve as a witness to the impacts of climate change in their congregations and communities and share important information about what we can do to better care for creation. This session is the first of a three-part training to equip you with the knowledge, hands-on experience, and resources to speak confidently on climate change, its impacts, and solutions. Following the summit, participants will complete the remaining parts of the training virtually. Together, we can care for God’s creation and work for climate justice. Session Description: Learn about living your faith and creation justice ethics in the wider world. This session provides practical tools for mobilizing effective action and advocacy in the broader community. Skill-building will include public policy advocacy, securing earned media, and ideas for leveraging opportunities for ecumenical and interfaith collaborations. This session provides practical tools for mobilizing effective action and advocacy in the broader community. Session Title: Financial Planning—Start Today! Session Description: Unbiased, expert guidance is hard to find. Now, more than ever, planning is an essential step towards financial well-being. A good financial plan along with sound advice can lay the foundation for a financial future that is more manageable and more secure. Join us for an overview of the planning process and learn more about what financial planning can do for you. Session Description: Nobody understands the complex financial issues facing clergy and faith-based leaders the way we do. Whether you are an employer or an employee, we offer peace of mind and financial security. Find out about MMBB’s benefits, investment options and financial planning services. Session Title: Help, We Need a Pastor! Session Description: The pastoral search process is a crucial and formative stage in the journey of the church. Yet it can also be a daunting task. The search process can either produce positive and/or negative energy. The pastoral call process has profound and long-lasting implications in the life of the church. Therefore, laying a good foundation and employing best practices can provide a healthy pastor-congregation relationship. It is important to remember that the church’s preparation for the search, their openness to the leading of God’s Spirit in the process, their clear understanding of the type of person the church is seeking, the church’s honest representation of themselves to the candidate and patience and prayer are all important pieces of a good search process. Session Description: Fundraising is more than asking for money. During this session, participants will discuss ways to communicate with existing donors and to persuade new donors to support critical issues facing the Church, our country and the world. Most people support causes that affect their hearts first, and then their heads. In this workshop, Cause and Issues-Based Fundraising participants will: Together we will examine ways that effective fundraising organizations use stories of change, and leverage volunteer support to increase donations. This is a dialogue-based session so come prepared to share, debate and question. Session Description: God is preparing to do a new thing in our midst. Do you perceive it? Are you prepared for that new thing? Are you preparing those following you? These are questions of succession planning: that critical ability to identify and develop leaders for the future. Succession planning is an important leadership skill because it provides us with the reflective space to discern God’s leading and recognize those whose gifts and abilities are best suited for the future, while also considering how God is moving in our lives and ministries. Thus, the workshop Leading and Succeeding for the Future provides leaders with strategic and tactical tools for succession planning in organizations, ministries, and churches. In this workshop, we will learn how to: Discern God’s leading in our lives and churches, freeing us to make room for others; Recognize and celebrate the gifts and abilities of others; Create critical development experiences to broaden skills; Foster a culture that is permissive and welcomes new leadership. Session Description: Can you remember the specifics about when a motion needs a second and when it doesn’t? Can you quickly bring to mind in the middle of a discussion how to properly amend a motion? And how often do these concerns for order actually get in the way of honest discussion that brings wide perspectives to the table? With apologies to the parliamentarians in our midst, there are more appropriate ways for ministry organizations to discern God’s vision for our work together, and better ways to make sure all voices are included in the process, than those to which most of us are accustomed. Additionally, there are many methods for gathering input that give attention to different personality types and cultural backgrounds, and there are elements of creating space for dialogue that are often missed. In Embracing a Noisier Table, participants will: Learn ways to gather input as effectively as possible, Explore the possibilities of the consensus model (with a note that what many of us take as “consensus” is not), Learn how to create a holding space for authentic conversation. Session Description: Today’s church records -- annual meeting minutes, clerk's and treasurer's reports, membership rolls, newsletters, etc. -- are “born-digital” in Word documents, spreadsheets, websites, social media posts, digital pictures, digital recordings, and other formats. But all of these digital records are more fragile than the paper of the past. Come find out what basic digital preservation steps you can take to ensure these records can be “born-again” (accessed in the future). The salvation of your church’s story is at stake! Track Description: “Social Media” is the buzzword of our era. It’s been celebrated as a way to keep friendships vibrant, vilified as an avenue through which the worst impulses of humanity find traction, and mocked as being little more than pictures of food and cats. Love it, hate it, or tolerate it social media is here to stay – and it’s spaces are where more and more human interaction is taking place. Social Media is the agora of the Information Age, and Jesus’ disciples be present in these spaces pointing to the light and hope of our savior’s good news. Time: 9:00 a.m. – 10:15 a.m. Session Description: This session will focus on the reality of Social Media identity and why it should be grounded in physical identity. Session Title: What’s the Purpose? Time:10:30 a.m. – 11:45 a.m. Session Description: This session will explore the different ways Christians interpret the idea of “sharing the Gospel,” and how these different interpretations can lead believes to use social media in much different ways. Time: 3:45 p.m. – 5:00p.m. Session Description: Learn the basics of the Accordance philosophy, design, and interface. Discover how Accordance Bible Software can revolutionize your Bible study and communication of Scripture. Session Description: Accordance allows you to search the Scriptures with blinding speed and efficiency. Learn how to access original language meanings from translated Bible versions and amplify to an ever-growing literary of biblical reference works. Session Description: Accordance Bible Software is an indispensable tool in the preacher’s workshop. In this session, learn how to create fully-searchable personalized content in Accordance as well as how to access sermon illustrations and striking visual images from a wide range of teaching and preaching resources. Session Description: If biblical languages get you excited, Accordance is ready for you! Take Accordance Bible Software to the next level with Hebrew and Greek texts and lexicons, syntax and diagramming tools, biblical language grammars and much more.